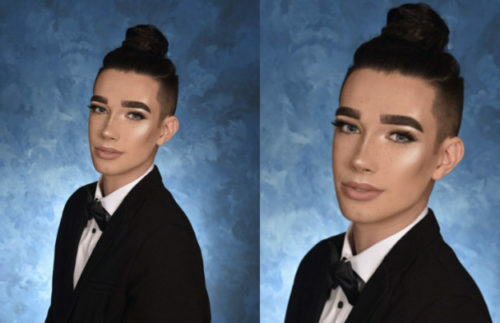 17-year-old James Charles has always been a little “extra.” So when the high school senior from Bethlehem, New York didn’t like his yearbook photo, he knew he had to give it everything to make it perfect. The aspiring makeup artist told Buzzfeed that the “lighting was not ideal for my makeup so all my hard work at 7am didn’t pay off”. Charles asked for a retake of the photo and to bring along his own light ring to the shoot. The company allowed him to bring along his own lighting and the results are perfection. Charles brought along his friend Delaney to the rescheduled photoshoot. The school allows friends to pose together, so the duo took a “mugshot” of our hero and sent the results out on Twitter. “I knew it would do pretty well on my Instagram page because my followers were really excited when I posted selfies from the morning of the original picture day, but I DID NOT expect the tweet and Insta pic to blow up this much,” he said. woke up at 7am today to yet glammed up… all I want to do is go back to sleep BUT my senior portraits came out bomb AF so it was worth it ? ?